How Do I Use Music Nutrition? Use Music Nutrition to support transformation for your whole body mind and spirit in every area of your life. Each soundtrack of Sounds of Solace is designed to upgrade, uplift, and raise your state so that you can heal and produce the results you want in life. As you hear the sounds and your body receives the vibrations, your own vibration will resonate and so to speak, calibrate.The sounds in Music Nutrition produce a resonance whereby your body literally gets on that same beneficial wavelength and dissolves the blockages in your energy field that are caused by thoughts, emotions, environments, food, trauma and pain in the body. How to choose which track is right for me? 2. Use body testing or muscles testing. 2b. think of an area most important to you where you want to see a shift and as you look at or hold each sound or colour CD, notice if your body moves forward or back . The one which corresponds to your YES is the CD you most need. Each track and package comes with dedicated workbooks that help you move through the challenge and qualities mentally, vibrationally, behaviourally and practically. They do not take too long however you will achieve even greater results when you download and work through them. We now have focus packs and audio transformations outside the core range of music nutrition packages. These are on the shop page and will assist you to keep shifting your state. These are specifically targeted to increase focus, creativity, relaxation, reducing anxiety and are all guided tracks moving you through a deep amazing process of change. Go to shop page for more information. Our mission is to shift stress and overwhelm in over a million people, educating about the power of frequency, vibration, the human voice and how music nutrition can help enhanced inspire your inner being to create the impact you want in your world. Feel free to send us an inquiry Contact Us Now!, about sharing this with your audience at events with Anikiko as a speaker or edu-tainer or how music nutrition might be able to help you or your family. Are you really living or just surviving? Think about an area important to you (e.g. 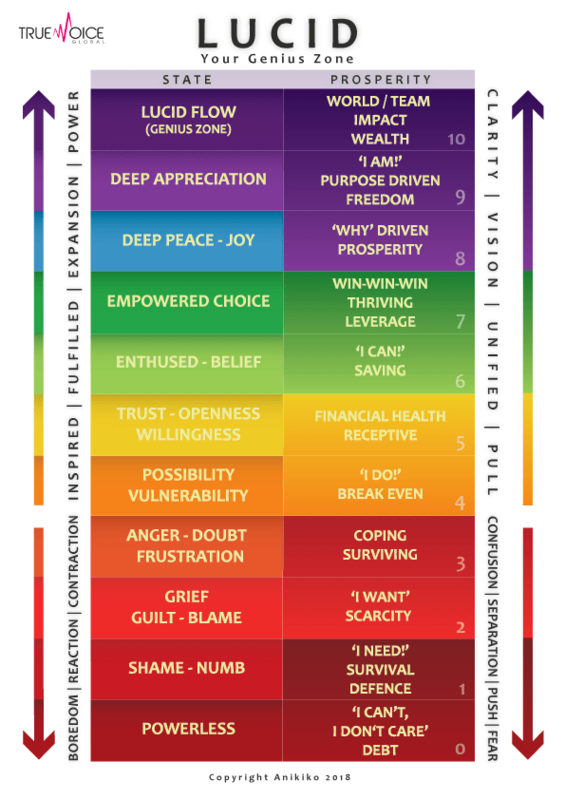 business, relationships, health, finances) and rate where you think you sit (0-10 – from Powerless to Lucid Flow) on the Lucid scale. The more you let go of the dis-empowered states of powerlessness, confusion. separation anger and doubt the less you sabotage your growth. Most people sit under 3/10 and feel heavy with doubt, fear and low self esteem or confidence. When you become comfortable with playing with this scale you can check into specific areas. You may feel an overall 7/10 in life which is wonderful yet feel there are areas in your life that you can grow in specifically and feel that with business/career you are in 3/10. Our aim is to get you to sit in a state of LUCID flow where by your vision is unified, you feel inspired, fulfilled, empowered clear and you pull in your market in business or you pull resources to keep you in flow. If we can get into the habit of shifting our state – no matter where, when or how, then the nervous system, chemistry, hormones, habits and energy will start to create new pathways and neural networks to support who you want to be. Yes, you are thriving! A state of success. Fully immersed and energized focus in what you are doing. This is a state of effortless success where you pull in resources and solutions to obstacles become clear, you feel empowered and embrace change very easily. You feel organised and the projects you are part of serve many at once. Prosperity focused everything you do is driven by a value and asset focus or contribution. Copyright text 2018 by Music-Nutrition.